Looking for a rain barrel for your garden? This Saturday’s second annual Northern Olentangy Watershed (NOW) Festival is raffling off 23 colorfully painted rain barrels. A rain barrel is used to collect rain water for reuse. The NOW Festival takes place from noon to 3 p.m. Saturday at Mingo Park by the shelter houses. In the event of rain, it will be held in the park’s gymnasium. One activity that is new this year is a canoe float down the Olentangy from Main Road to Mingo. Piper said registration is completely full with 50 participants. In addition, there is a chance the float will be canceled if the water level remains high. Other activities include rain barrel and rain garden workshops, an enviroscape (a portable interactive environmental education model), plant filtration, collecting water bugs and fish, composting demonstration, craft table. 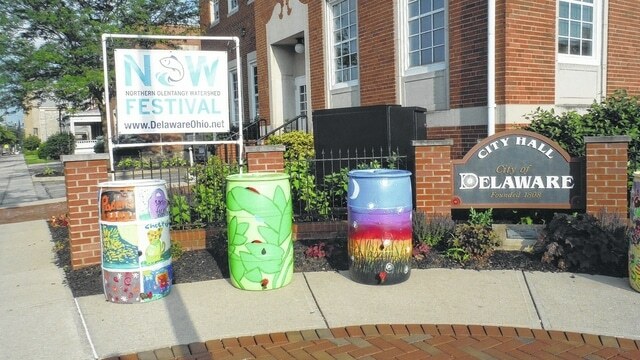 Piper said there will be literature available on rain barrels, rain gardens and filtration — and at vendor booths such as the Army Corps of Engineers, ECO Center (in Morrow County), Del-Co Water Company, ODNR Division of Watercraft and Wildlife, Olentangy Watershed Alliance, Preservation Parks of Delaware County and the Sierra Club. Food and drink will be available for purchase from Dan’s Deli and Rocky’s Italian Ice. Delaware is unique in that it now has a NOW Festival. “Unfortunately, there’s not too many communities that do a river festival event,” Piper said.